I’ve been doing quite a bit of thinking over the past few months. It’s funny how ideas can come and go, but occasionally one will relentlessly stick in your brain. This is one of those ideas. For some time I’ve been contemplating a side project to work on as a hobby at home. Now that Adeline is two, and I’m not completely exhausted at the end of the day (or maybe I’ve just built up stamina? ), it seems like I finally have a little time and some mental energy to put into doing this. I’ve decided to make a game on my own. Nothing complicated, and I really don’t think you could call it a ‘game.’ More like a proof-of-concept. Or maybe more like an attempt to create a thing that does a thing. That last bullet point in particular is going to be tricky for me. I naturally want to plan out everything I’m going to do, but in doing so I usually over-complicate the process and end up making decisions without even testing my options. So for this project, I’m going to keep everything fluid and fun. If I get stuck on something boring, I hope I’ll have enough discipline to switch gears to something more exciting, and then be able to come back and finish what I was initially thwarted by. Since I’m not a programmer by any means, this scenario will probably happen a lot! 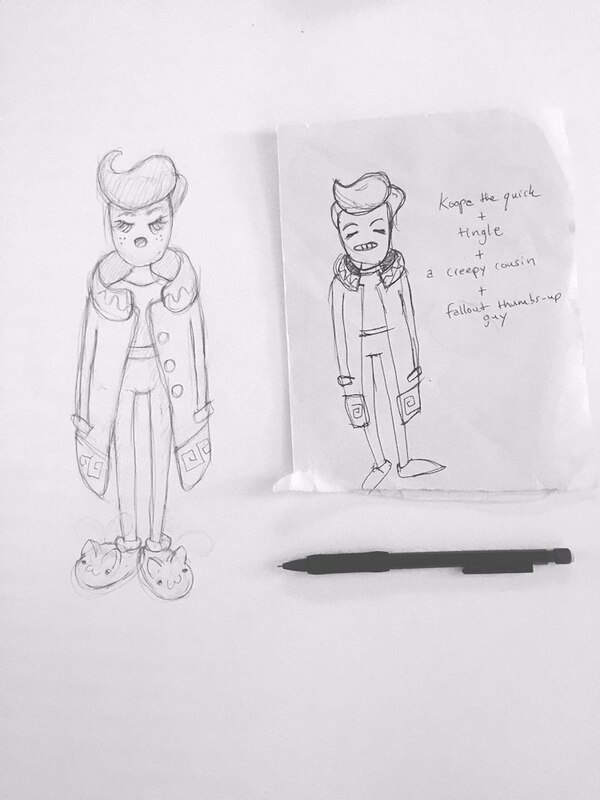 Finally, I’d like to end this post with a photo of an initial character design. Earlier when I said I had this idea stuck in my head, this guy was one of the main things. Now, if you will, imagine this maniac prancing around in a sunny meadow like a kitten ballerina. Oh yea, that’s the stuff.